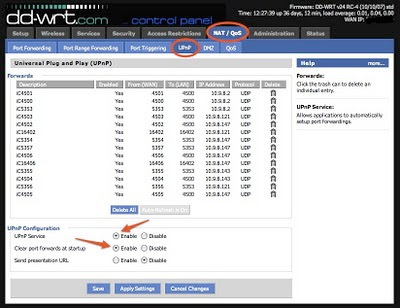 If you have Apple computers running OS X 10.5 or later and want to be able to access them via iChat screen sharing or "Back to your Mac", or you have PC's or other devices that support UPnP, you will need to enable that feature in the router. Be warned that enabling this will allow port forwards to be created in the router. It is possible that you can download malicious software that will create these port forwards and then cause bad things on your computer. Use caution when downloading or running software from the Internet to avoid these and other problems. That being said, I am running UPnP on my router and find it very helpful. 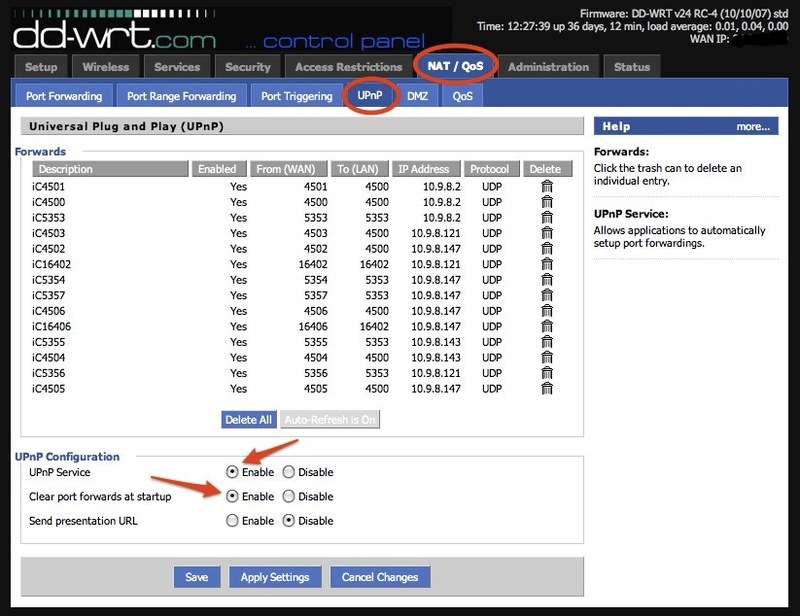 2) Click the radio button to enable UPnP Service. I also checked the button to Clear Port Forwards at startup so that when my computer reboots and machines get new IP addresses, the old ports are cleared out. 3) Click Save and Apply Settings. As you can see, I have a number of computers in my network that have registered ports. All of these are ports that Apple requests in OS X 10.5 for screen sharing and .Mac's Back to my Mac.